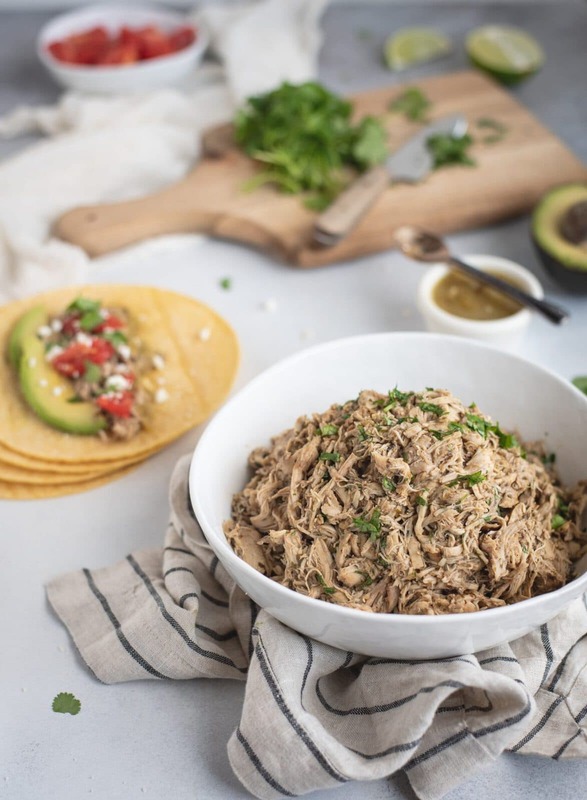 This slow cooker cilantro lime chicken is one of the best easy ways to do shredded chicken that can be used in tacos, burritos, or whatever you want! Tacos are one food I could eat anytime. Like wake me up at 3am with a taco and I’d probably be cool with it. Probably. Other foods, not so much. Something about that flavor intensity and freshness is just always a win. 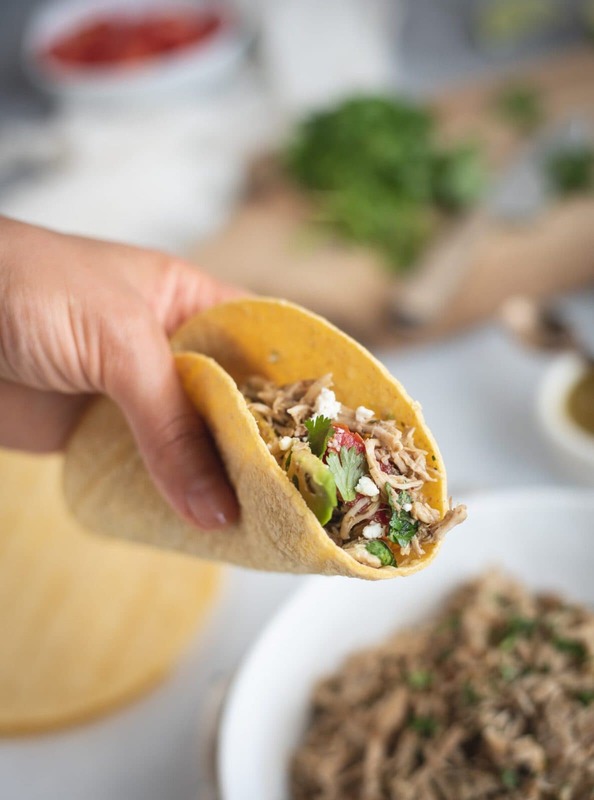 As a fellow taco lover (safe assumption since you’re reading this), you most likely know that not all tacos are created equal. Some are kind of ho-hum and others, just straight up blah, not even worth the effort. Well slow cooker cilantro lime chicken does not result in that kind of taco. Rest assured, this is the good stuff people. I love my ground turkey taco recipe and this crockpot salsa chicken, but I’ve been really into green salsa and cilantro lately (okay, like always) and wanted to create something a bit different. And with fall creeping in fast, the crock pot is full swing over at my house so it just had to be a crock pot recipe. That and my new Instant Pot, but that’s a story for another day. Hint: Instant Pot recipes are coming soon. Pretty in love with that contraption. Although I came in hot out of the gate talking about tacos, this slow cooker cilantro lime chicken recipe is quite versatile and isn’t just for tacos. I used it in some delicious burrito bowls with brown rice, beans and all the fixings sprinkled on top. I also used some of the leftovers in a casserole like this quinoa one and that was absolutely phenomenal. I put some into stuffed peppers one night too which was pretty fantastic. And yes, I’ve made this recipe quite a bit lately. Like most crockpot recipes, you can easily double this recipe and freeze the leftovers to make for quick future weeknight dinners. You may have to increase the cooking time but that would probably work better for people that want their dinner to simmer away while they’re at work. I have to say that being able to bust a container of pre-cooked, delicious shredded chicken out of the freezer and have a tasty dinner ready in half hour or less is a beautiful thing. I used chicken thighs because they’re fattier and work much better in shredded chicken recipes, but you can always sub for chicken breasts if you’re really worried about that extra fat. Just know it won’t be quite as juicy, but that kind of goes without saying. The picture below shows the whole gang. Lots of spices, lime, cilantro, and green salsa. Yum. 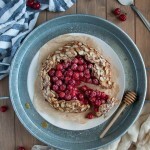 One note on cooking time for this (and all slow cooker) recipes – know thy crockpot! Some cook faster than others. I love my slow cooker and have had it for years so I know it cooks a little faster than others that I’ve owned. Because of this, the cooking time is a range. Like most shredded meats, if cooked too long, it will get mushy. The recipe is somewhat forgiving though. Sure, the texture will suffer if it goes too long, but give or take an hour on the low setting shouldn’t ruin it by any means. You want to wait until it shreds easily but it shouldn’t be falling apart on it’s own. Chicken thighs are lower in fat than pork so it won’t fall apart like shredded port shoulder does (in case you’re used to making carnitas), but it will shred somewhat easily when it is done. I know that not everyone is a cilantro fan and you can definitely leave it out if cilantro isn’t your jam. I love it and think it would be lacking, but that’s only because cilantro is built into my physical makeup and I’m a die hard fan. I wouldn’t even suggest the possibility of leaving it out if I wasn’t fully aware of the massive cilantro hating population out there. I have a few friends that can’t stand it! I guess you’ve got to follow your own tastebuds. Just know that the salsa, seasonings, and lime are imperative if you’re leaving the cilantro out. Also, if you’re looking for some delicious taco toppings, I have recipes for pickled red onions and fresh blender pico de gallo that are pretty killer. I typically do flour tortillas but used corn tacos this time and they were pretty tasty. I just can’t get over the fact that they break as soon as you bend them. Drives me nuts! I’m either a flour tortilla or burrito bowl kind of girl. But if you can manage the corn taco life better than I can, they’re pretty tasty here. If you follow me on Instagram stories, you might have seen how much my little nugget loved this shredded chicken. We switched to letting her feed herself most meals and she LOVED this one and whimpered for more. Babies don’t lie! It has been fun seeing her learn to feed herself… but is also a hot mess. On the flip side, I can clean a high chair from top to bottom in record time at this point. By record time, I mean, probably about 15-20 minutes because somehow everything on that tray gets matted into the straps, ends up on the wall five feet away, in her diaper, hair, and every crease in her chubby little baby bod. This chicken was no exception. With the weekend right around the corner, add this one to your next week’s menu! Its a winner and, if doubled, can last for several meals! place chicken in an even layer on bottom of slow cooker. Sprinkle cumin, chili powder, garlic powder, onion powder, oregano, and salt evenly on top of chicken. Pour salsa and lime juice over spiced chicken and set crockpot to cook for 3-4 hours on high or 5-6 hours on high. Once chicken is fully cooked, use two forks to shred chicken. Stir in chopped cilantro and serve. *To make this a freezer meal, pour all ingredients into a freezer bag and shake to evenly coat chicken. The cilantro will be less pronounced in the final dish than when adding fresh but still delicious! This is delicious!! I made it in my Instant Pot, cooking it for 11 minutes or so on high. I also added black beans and bell peppers. The flavor, with the lime/green salsa/cilantro, is amazing!